The Cotes du Rhone classified vineyards extent over 44.735 hectares. 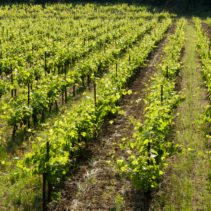 The main vine varieties are Grenache, Syrah, Mourvedre. They can be had in three types of wine : red, rose and white. We only produce red of which we have three vintages. The blends are mainly or only Grenache and Syrah. Made from old Grenache vines situated in the village of Sablet. This village is classified ‘Cotes du Rhone Village. To mention ‘Cotes du Rhone Village’ on our label, the parcel should have been planted with two vine varieties. We preferred to keep the old vines… 100% Grenache. The name of this wine ‘Jardin Secret’ comes from the sensation we have when we enter these vines. ‘ A secret garden’…. it was Justine Saurel the oldest of the siblings who found the name. 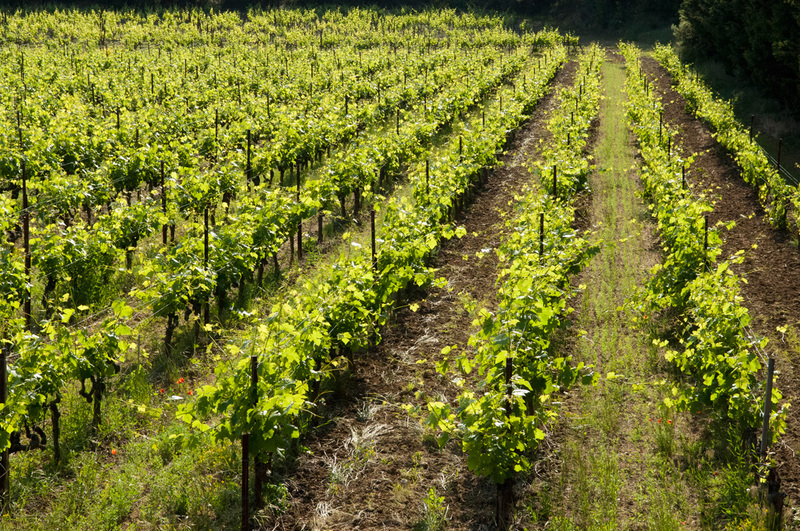 Vine Varieties : 100% Grenache. Age of Vines : 55 years old. Soil type : Helvetian sand and sandstone. Aging : In cement vats 18 months, then in bottles. 100% oak free. Winetasting : A deep red wine revealing on the nose silky hints of raspberry, of liquorice and vanilla. The mouth is dominated ever present tannins, soft round and of a lovely composition. The tasting brings aromas found on the nose, with length and a good olfactory return. Vines situated in ‘Sarrians’ near the parcel called ‘Le Clos’. They are protected on two sides by a forest. The micro climate here is cool. They are vines rented to Eric Saurel in 2007 by a neighbor who liked to see our Bio-Dynamic work. He was happy to see his vines pampered as he had done. The Syrah expresses itself like the Syrah of the northern Rhone Valley vines commonly known as ‘Sérine’, thus the name. Vine Varieties : Grenache, Syrah. Winetasting : A young wine, easy to drink with melting tannins. This wine awakens and stimulates our taste buds. Its name was thus found! Age of Vines : 25 years old. Soil type : Garrigues’ or plain soil andHelvetian sand and sandstone. Winetasting : A fruity, mouth-watering wine. On the nose it reveals aromas of cherries and raspberries. It lines the mouth and the palate and the fruit remains present. This range of wines, available since 2013 in red, white and rosé will awaken and enliven the papillae. Its name was well chosen! Pruning: Goblet or Royat cordon pruning with a maximum of 6 spurs and 2 buds. Vinification: Direct pressure after total de-stemming – natural yeasts from grapes – stirring of lees. Maturing: In bottles – Bottled in the spring – 100% wood free. Tasting: It is a friendly wine, fruity yet full. Food & Wine Pairing: A wine to accompany summer dishes or fish dishes. A table rosé, & also for an aperitif. Tasting: On the nose, it reveals delicate hints of honey and white flowers. In the mouth, it covers the palate bringing lemon and mineral notes. Its freshness and balance are noticeable. Food and Wine pairing: It can be drunk as an aperitif, with grilled meat or fish, barbecues, fresh fish or tuna.